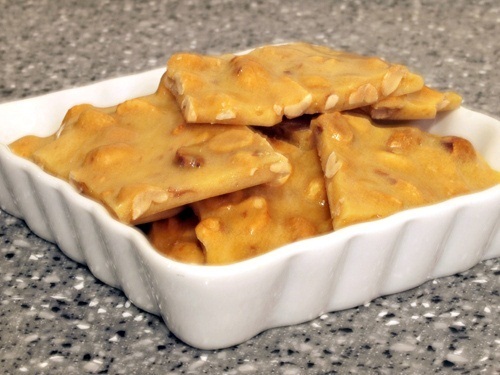 This peanut brittle recipe has been knocking around in my recipe box since the early 1980’s. I’m the first to admit it isn’t the healthiest recipe. Besides peanuts, the main ingredients are corn syrup and sugar. Although I usually make it only once a year, this peanut brittle recipe still holds a special place in my heart. Way back when microwaves were new, and roughly the size of dorm room refrigerators, my mom took the plunge and bought our first one. The microwave oven came with a cooking class (which is funny to think about now) and Jim and I went. This was one of the demo recipes. I wish I could give proper credit, but I don’t even remember the make of the oven. Lightly oil a 13 x 9 inch flexible rimmed baking sheet. Stir the sugar and corn syrup together in a 2-quart bowl. Cook for 4 minutes on high. Stir in the peanuts and cook for 4 more minutes on high. Mix in the margarine and vanilla and cook for 2 more minutes on high. The brittle should be a golden color. Stir in the baking soda and quickly spread the mixture in a thin layer on the prepared sheet. Let cool completely. Flex the pan to release the brittle, then break the brittle into pieces. 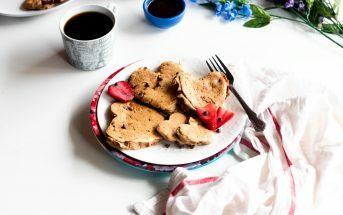 Tamasin (Tami) Noyes is the author of American Vegan Kitchen, a cookbook that covers everything from diner comfort foods to modern bistro fare, with a solid focus on flavor. She also co-authored Vegan Sandwiches Save the Day! : Revolutionary New Takes on Everyone's Favorite Anytime Meal, and has a vegan grilling cookbook in the pipeline. 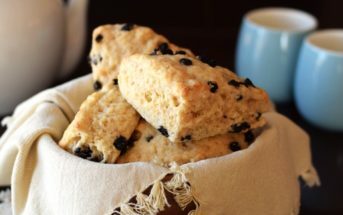 For even more of her recipes, visit Tami at her blog Vegan Appetite. Is it possible to substitute the margerine for coconut butter or cream?